Law Alive : The New Zealand Legal System In Context - ubiq bookshop: the best place to buy books! 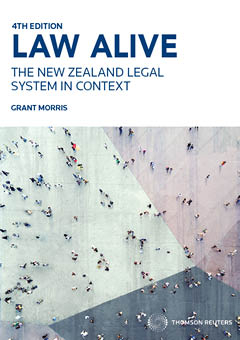 Now in its Fourth Edition, Law Alive continues to be a must have introductory text for students studying first-year law at New Zealand's law schools. As with the previous editions of the book, author Grant Morris brings the study of law to life. The topics discussed in each chapter are linked to real life examples of how legislation, case law, events and legal personalities shape and change the fabric of this country's legal culture, political landscape and society. Featured in the 11 March 2019 New Zealand newsletter. Featured in the April 2019 Law newsletter.